I feel so energized and excited after reading posts on Six Degrees of Francis Bacon, which tracks a project to analyze the Oxford Dictionary of National Biography and generate a digital representation of the English early modern social network. 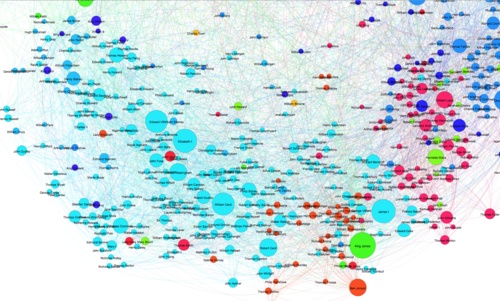 They are just beginning to post early-stage, large-scale visualizations of their current database. Why does Henrietta Maria have a community distinct from her husband and those most proximate to her? Why does Jacob Tonson sit so far out to the upper-right hand corner? Why are certain nodes so evidently out of place? When and why don’t communities align with proximity, color with clustering? The problems call out for further explanation, interpretation, and speculation especially by experts with knowledge of the period, of particular figures, or of graph learning and/or visualization. Lincoln, Matthew D. "Six Degrees of Francis Bacon." Matthew Lincoln, PhD (blog), 09 May 2013, https://matthewlincoln.net/2013/05/09/six-degrees-of-francis-bacon.html.